As I’ve mentioned on the previous post on the Sick Submitter Review I’ll be trying out the next software I want to use and try out for a month, which is the Ultimate Demon. 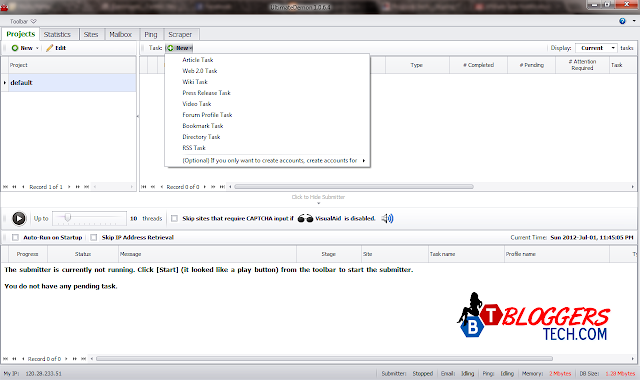 This is created by EdwinSoft the creator of the successful and known social bookmarking software, the Bookmarking Demon. They have other products too and I’m going to offer you also some discounts for that as soon as possible. WHAT’S THE DIFFERENCE BETWEET THE ULTIMATE DEMON AND BOOKMARKING DEMON? Bookmarking Demon obviously do the social bookmarking in autopilot. Just that! Nothing more, nothing less... It’s known and being used with lots of marketers these days because of its quality bookmarking sites available and of course the software itself too. If you’re not happy with the current list of websites that is on the Ultimate Demon software, no worries! You can also add sites that fits to the platforms that it can support. No need to learn some codes, but just grab the list of websites and paste it on the Ultimate Demon and done! Another thing is that the software also support captcha services like DeathByCaptcha and similar services, I think it has also its own captcha solving (NOT SURE YET.. WILL LET YOU KNOW). You can then totally build links while you’re playing games, shopping or even do some house chores. It also has an in-house scraper with it, I’m not sure with the quality and success rate with the scraping, and maybe you won’t need Scrapebox anymore (which I’m also planning to buy). There are other more GREAT FEATURES along with the Ultimate Demon software. You can also read more about its features by just visiting their website here. Alright! 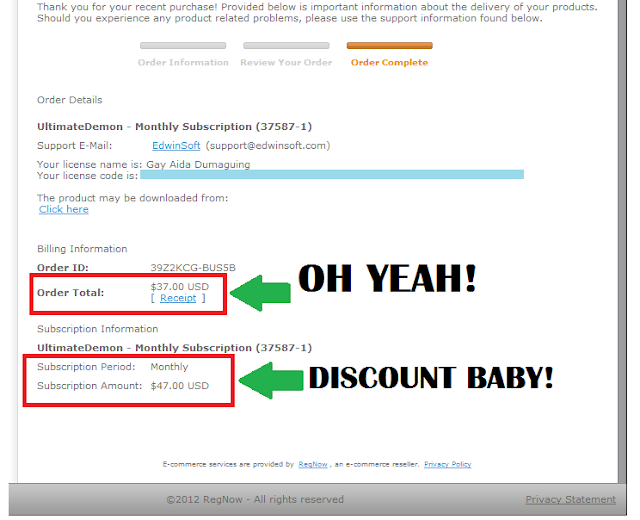 If you want to try out the software yourself (just like me) then I want to share with everyone the discount that I got. MONTHLY SUBSCRIPTION - $10 DISCOUNT – GET IT FOR ONLY $37 INSTEAD OF $47! This is the one I got. I avail their monthly subscription service and grab the opportunity to get it for only $37, $10 discount is big for me and I want to have it! 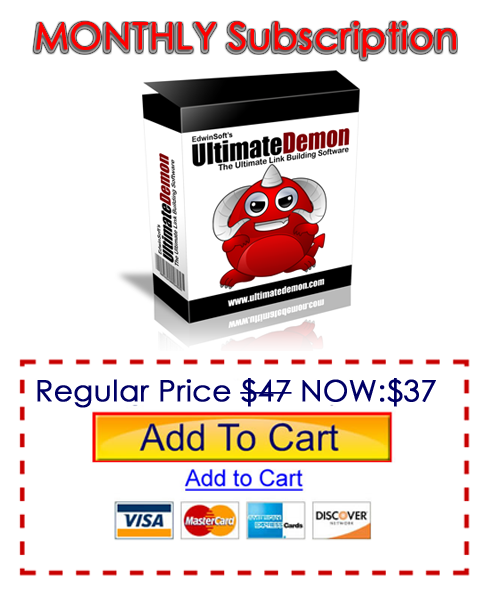 Yes, the REGULAR price on the OFFICIAL Ultimate Demon website is $47 and using the links that I have, you get it with less $10. Want to see it for yourself? Then just CLICK HERE to visit the website and see it for yourself. *Please clear browser history and cookies for a successful implementation of the discount BEFORE you click the link above. 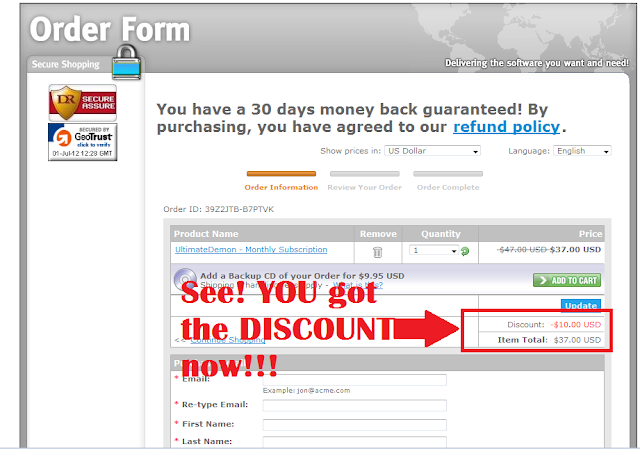 ONE TIME FEE - $50 DISCOUNT – GET IT FOR ONLY $347 INSTEAD OF $397! 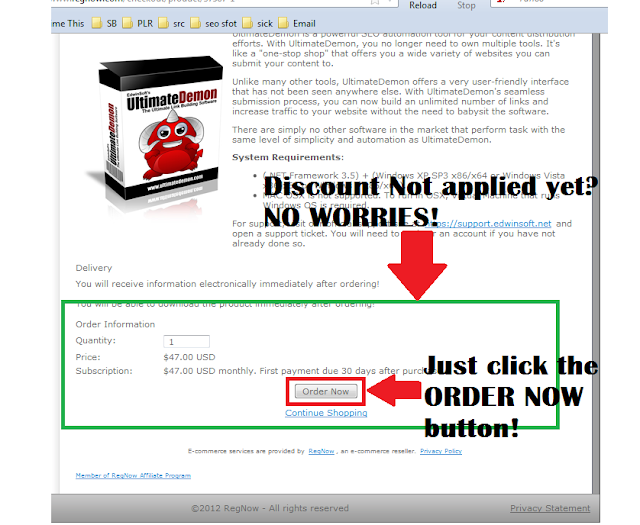 Imagine that, you get it a $50 discount by buying the software in onetime fee. If you’re one of those people who are confident with the products of EdwinSoft then go for it! I never tried the other products yet, so I want to go and try it for a month first. 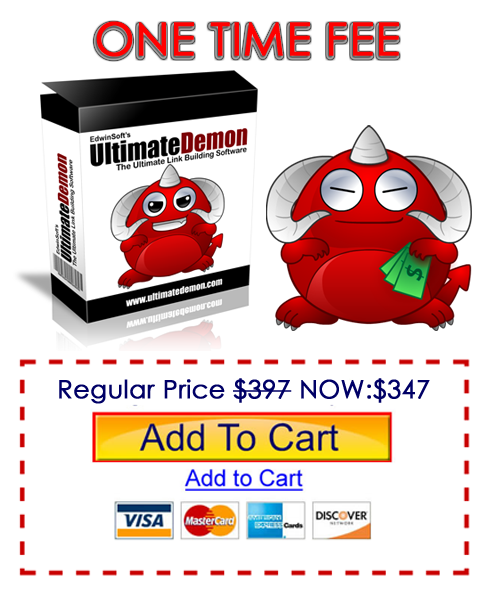 As usual and if you’ve seen it on the OFFICIAL website of Ultimate Demon, the ONETIME FEE is $397 and using the links I have, you get it for $347 only and get to save and enjoy $50 discount. When you buy ULTIMATE DEMON through Bloggers Tech you get these as a BONUS! FOR ONE MONTH SUBSCRIPTION BONUSES! 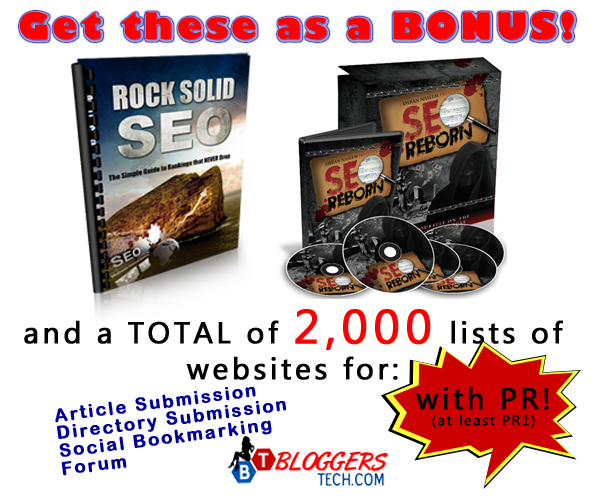 You only get to choose one the ROCK SOLID e-book and the 2,000 lists of websites. FOR ONE TIME FEE BONUSES! You get all of the said and displayed on the image above. As you can see THE BONUSES are NOT JUST ANY OTHER EBOOK (like fitness, making money, etc.) but they're ebooks that could help you a lot in the process of getting to know more about SEO. They're PAID ebooks that I have and allowed me to make this as the bonus of this product. These ebooks included in the bonus will (I think) help you in learning more about SEO, link building and internet marketing. In this way, you will also be guided in the process of also learning using the Ultimate Demon. THINKING TWICE OF THE DISCOUNT REALLY WORK? I wont going to post it if I haven’t tried it myself, so as I was purchasing it I made some screenshots as a proof and well, of course to guide you to the process. When you click on the link below, there will be ANOTHER WINDOW that will open with this content. As you can see, the discount is not yet there. NO WORRIES, just click on the button. It’s not final yet so don’t worry. Obviously, when you click the button said above, you’ll then be redirected to this page below where AS YOU CAN SEE the price WENT DOWN to $37 now, instead of $47. I don’t have the screenshot for the Paypal details (where I paid) since some personal details are displayed and I don’t want to show you that. LOL. So below is the SUCCESS PAGE of purchasing the ONE MONTH subscription. I remove a line there where my LICENSE is displayed, and as you see my name is there. The download link for the software and license is also IMMEDIATELY PROVIDED. OH YEAH! 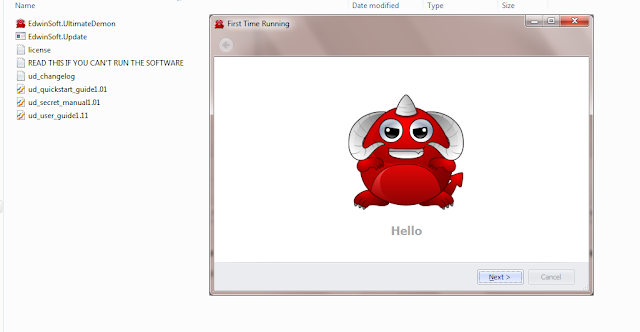 So after I installed the software, set it up and run! Here’s what I’ve got. So cute! MY GOODNESS! In the background you’ll also find some files, I just want to show you that. 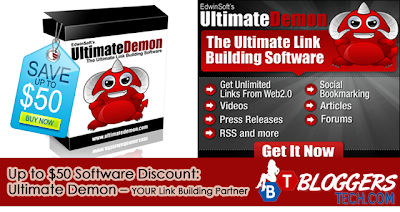 Grab YOUR own copy of THE ULTIMATE LINK BUILDING (as what they claimed) software for your blog, website or business today! If you want to hear about this promising software, subscribe on Bloggers Tech where I’ll be posting a review on this software after a month of trying this out. If I’m happy with it I might let you see what’s inside and give some tutorials. I HONESTLY WOULD NOT advice for NON-EXPERIENCED people to use a link building software, you might just be shock of how fast and how many you could build links to your website or blog that you would build thousands of links in a day. 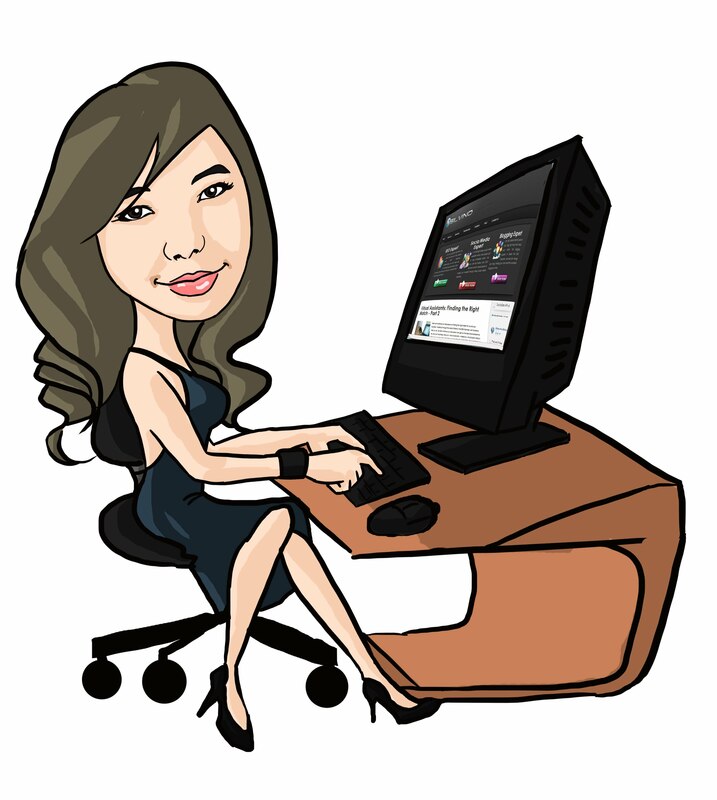 Without the right knowledge, experience and guide you might just get your website be banned. BUT ANYWAY, the E-BOOK that is included as a BONUS is a great guide that might give you an idea. But just be careful, with the PROPER use of any software you will reach success in ranking and gaining traffic to your website. YET, with ABUSE and without knowledge on the OVER use of these kinds of software you might just get what you don’t want to happen. Still it's all up to you if you want to buy and try a link building software or not. INTERESTED TO GRAB THE DISCOUNT? Grab THIS HUGE DISCOUNT TODAY! Remember, THIS IS FOR ONLY A LIMITED TIME, the price MAY increase as offered by the creator and this is your chance to get it in an affordable price. So if you want it, got the money then go on and grab a copy of THE ULTIMATE DEMON! Order now! please use the button below OR just CLICK HERE. For more questions and inquiries feel free to leave it as a comment below. I'll try to answer your questions (if I know about it) or maybe let's ask the creator of this software. Bloggers Tech is not responsible or offer support for this product, please contact the creator if you've got some issues. I'll also have my HONEST review on this product soon (probably a month after) and if you've got your experience to share, feel free to email it to me if you want to include it on my post.